When it comes to a snack stadium versus a real stadium, especially in terms of the biggest football game of the year, we’ll pick the edible route every time. Why pay thousands of dollars for a ticket when you can have your own stadium… and eat it too. Now that the Big Game is just a few weeks away, it’s time to start planning your watch party! If you missed our previous post on ‘6 Tailgate Party Ideas You’ll Want to Copy’ – check it out here. But, when it comes to feeding a crowd more than tacos or burritos, it doesn’t get much easier than throwing a bunch of favorite items together and letting everyone feed themselves. We’ve seen some intense snack stadiums on the internet but for your sake, we kept this one as easy as it gets. The best part? 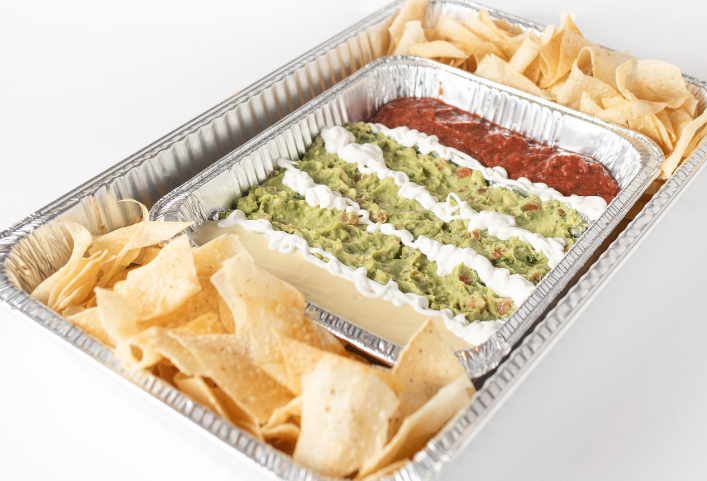 You can pick up the chips, salsas, guac, and queso at your local Salsarita’s restaurant! 1. First, you’ll want to assemble the pans so that the smaller cake pan fits rectangularly into the ‘giant sized’ pan. We recommend adding in the chips next, on either side of the smaller cake pan. This will be your “crowd”! 2. Then, you’ll want to create a foil ‘barrier’ to keep your dips separated. Take small sheets of aluminum foil and fold in half so that it’s a little sturdier. You’ll want to fold these up and put them into your pan on either side of where the guac will be. These will be the dividers that keep your salsa and queso separated from your fresh guacamole! 3. 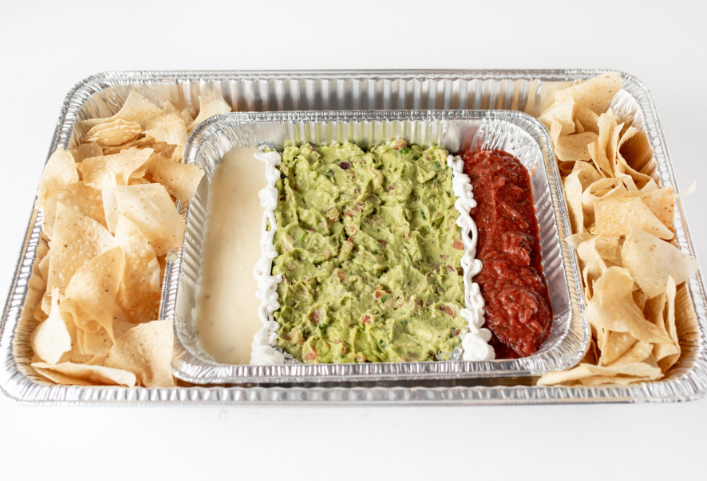 To make your “grassy field”, carefully add your guac into the middle section and smooth it out on the top. 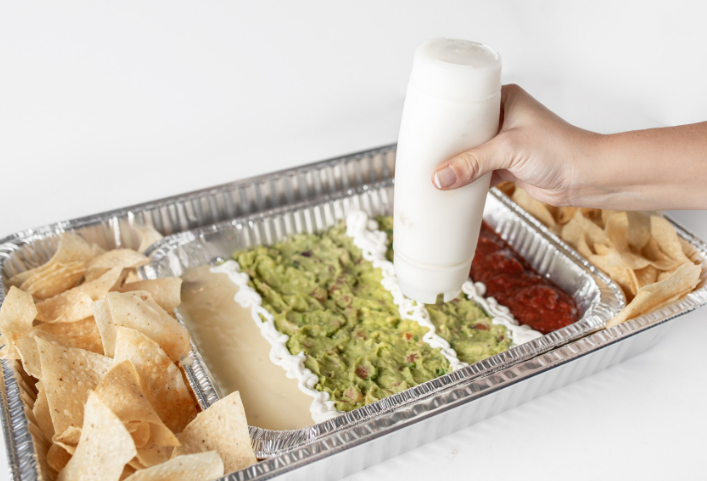 Then add your salsa and queso to the “end zones” making sure the aluminum foil sheets stay up and keep the dips separate. 4. Pour sour cream into a piping bag or use a sandwich bag with a tiny hole cut into one corner. Draw your field and end zone lines. 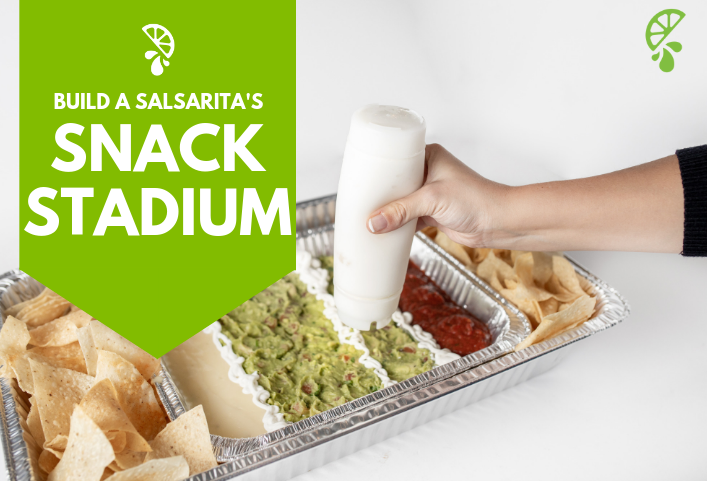 Serve your snack stadium and enjoy the game!